← Enjoy The Trannie, Ladies! This astonishing piece of journalistic excrement does not come from a rabid, drunken libtard blogger, but from a big news outlet; evidently made from the same libtards who write the drunken, rabid bloggers mentioned above. Of course, someone considered a genius by Libtard standard must have looked at it and spit his coffee on his desk, and the rubbish was removed. But the tragedy is that it was posted in the first place. I am not saying here that the man who wrote the title should be fired. I am saying that everyone involved with this should be fired. This is a level of stupidity and childishness astonishing even for Libtard standards. To think that this very same outlets “informs” millions about serious world matters, and millions are ready to believe what they write, is simply mind-boggling. No wonder the readers of such outlets dwindle, as less traditional but more informed sources become the place where people with a brain go to get their news. The sad thing is that, in the end, Libtard is who Libtard reads. Therefore, shops like MSNBC can be sure that as the mother of the idiot is always pregnant, so there will always be libtards in great numbers willing to read this rubbish and think it's professional journalism. Whether it's enough to make good money remains to be seen. But I think it will be enough to allow countless reprobates to go to hell with the high speed train. 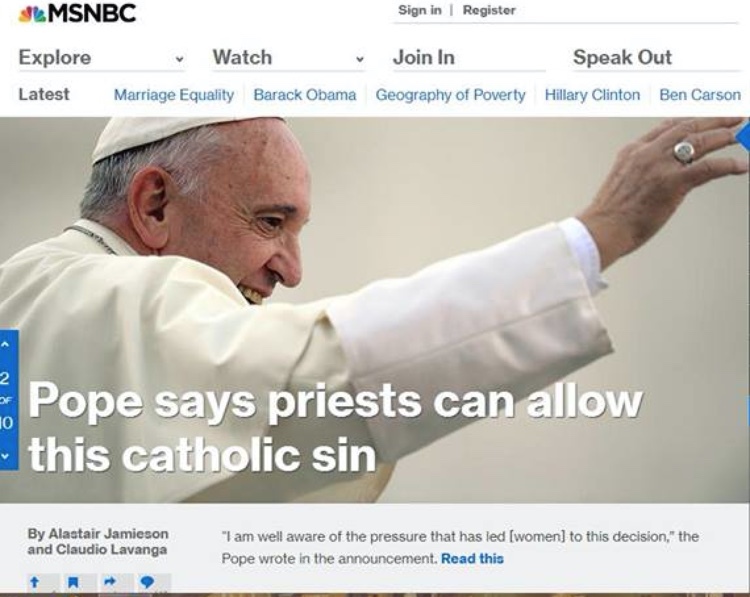 Posted on September 3, 2015, in Catholicism, Conservative Catholicism, Traditional Catholicism and tagged Libtards, MSNBC. Bookmark the permalink. 3 Comments. I think it was bishop Sheen who once said. “If you want to find out what is happeing in the world don’t read the newspapers.” I think that he would apply the same nuanced proscription towards the TV medium as well. If judgement is the only sin and tolerance is the only virtue, it is understandable that the secular media publishes such things. Sin is considered a ‘silly rule’ rather than a transgression (?) against God’s (Who?) will (what ever that is). The message from the Pope certainly gives the impression that “we don’t judge you about your decision to have an abortion” retroactively it is certainly merciful but for those who plan on having an abortion ‘tomorrow’ it could be interpreted as ‘don’t worry about it we understand’. – Still waiting on appropriate bold statement from Rome on the Planned Parenthood demonic used body parts sale. I think your expectations are a bit high for MSNBC and a bit low for EVERY BISHOP. The media have a duty of correct reporting. These are professionals. May the average street idiot have his head full of rubbish, a professional of information must at least get the information right.